As we have talked about in the past U.S. foreign policy was based on the concepts of containment and deterrence. Containment meant stopping the spread of Communism. the Cold War ended with the break-up of the Soviet Union in 1991. While the United States emerged as the most powerful nation in the world, the attacks on September 11, 2001, proved that even powerful nations like the United States were vulnerable to terrorist attacks. After the September 11 attacks, President George W. Bush developed a new American security strategy to prevent terrorists and dangerous regimes from developing, acquiring, or using weapons of mass destruction. 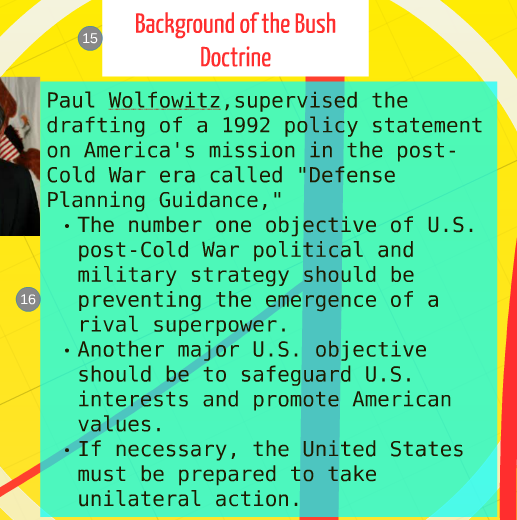 The new strategy was called the Bush Doctrine. 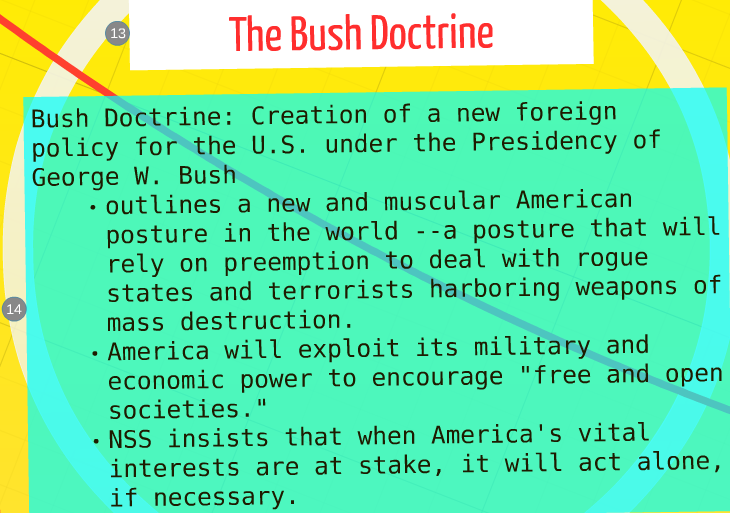 It is safe to say that the Bush Doctrine took us in a radically new direction following 9/11. The Bush Doctrine advocates for the use of "preemption", defined as "preemptive and preventive action." As Richard Perle has stated in the documentary Why We Fight, "what is the big fuss about preemption?". ​Bin laden wrote that America and the United Nations has oppressed Muslims unjustly which had lead to a massacres towards Islam. 4th Hour. The Attack on the United States On September 11, 2001, Islamic terrorists, with the support and funding of the renowned terrorist organization Al-Qaeda, attacked the United States. The assault on the nation was unconventional in nature. Instead of a military invasion, terrorists hijacked four aircraft and used them as projectiles. The first aircraft struck the North Tower of the World Trade Center facility in New York City at 8:45 a.m. Then, just shortly after 9 a.m., a second plane barreled into the World Trade Center's South Tower. It immediately became apparent that the United States was under attack. Two additional incidents occurred in Washington, D.C. and in western Pennsylvania. In Washington, terrorists used a third plane to assault the Pentagon at 9:45 a.m. In Pennsylvania, hijackers commandeered a fourth plane, but, thanks to a valiant effort from several passengers and crew members, the aircraft crash landed into a field instead of another significant target. By nightfall, both World Trade Center buildings had collapsed, the Pentagon suffered significant damage and the United States was shaken. Over 3,000 Americans perished during the September 11 attacks, including all individuals on board the aircraft, thousands at the World Trade Center and dozens at the Pentagon. President George W. Bush addressed the nation with a powerful message that reassured the resolve of the American spirit and promised swift justice for those involved. Student will assess the importance of the terrorist attack of September 11, 2001, and the dramatic impact it had on the United States. Students will select passages from the reading to determine what influenced and motivated Osama bin Laden to declare war on the United States eventually leading to 9/11. Students will evaluate how our foreign policy following the collapse of communism contribute to the attacks on 9/11. "When the debate and controversy begins is how far does the United States go, and when does it go from a force of good into a force of imperialism." "People complain a lot about American arrogance and power. But the great threat for the future is not American power and American strength. It would be American weakness and American withdrawal." These two quotes have always sparked a wide range of emotion and conversation in my class. It can easily be said at times that the United States foreign policy and the way we go about our global business can make the average american take pause. In this unit we will be examining many ideas that force us to ask ourselves if these quotes apply to the United States today and more importunately are necessary in today's ever volatile world of terror and global supremacy of nations around the world. National Geographic "Inside 9/11" Disc 1 "War On America"
Student will be able to evaluate the policy of containment and the effects it had on the United State before and after the collapse of the Soviet Union. Students will be able to compare and contrast United States foreign policy under the presidencies of George H.W. Bush and Bill Clinton. Part 3, "Monsters to Destroy," begins with the tearing down of the Berlin Wall and the end of the Cold War. As the sole superpower, the United States under George H.W. Bush, Bill Clinton and George W. Bush sends troops abroad in a series of small but unpredictable and deadly military actions, from the Gulf War to Somalia, the Balkans, Afghanistan and Iraq, each with its own compromised objectives and unforeseen consequences. (TRT:1:30:00) Manifest Destiny identifies and critiques key ideological assumptions that have guided U.S. foreign policy throughout its history and continue to influence decision-making today. Commentary by respected historians, journalists and diplomats fill in the dramatic stories that each episode tells. Please copy the link below and paste it into your link bar to view Part 3, "Monster to Destroy". We now know that Osama bin Laden and Al Qaeda grew to prominence during the Soviet occupation in Afghanistan (Soviet/Afghanistan War). We also know know what spurred Osama bin Laden to call for Jihad (war) against the United States leading up to 9/11. Bin Laden was angered at the way the Saudi government invited U.S. military forces onto its soil to launch a war on Iraqi forces, which invaded Kuwait. The Gulf War of 1991 gave Bin Laden a new mission and that was to destroy or get back at the United States. Therefore, how does the collapse of the Berlin Wall have anything to do with the eventual "War on Terror"? With the collapse of the Berlin Wall came a huge foreign policy shift that took us away from containment and shifted our foreign policy into unknown and uncharted territory. As Hal Brankd's writes in his book, From Berlin to Baghdad , "for more than four decades, containment of communism provided the overriding goal of American foreign policy, allowing generations of political leaders to build on its concepts. But with the collapse of the wall the United States attempts to devise a new grand foreign policy strategy that could match the political efficacy of containment". On the morning of 11 of September our country drastically changed forever but how did we get to this point? This unit is about just that....the build up to 9/11 and the war on terror.